The owners of local favourite Tartine Bakery recently opened this all-day dining hub that features a café, bakery, coffee kiosk and wine bar. The brunch features new twists on classics, like coddled eggs with dashes of trout roe and horseradish, porridge topped with ricotta and apple butter, and a yogurt bowl with a hit of bee pollen. Don’t leave without a loaf of housemade bread, available after 10:30 a.m. until it’s sold out. The wait times for a seat at the bar of this 100-year-old seafood institution can be long (especially at lunchtime), but fresh Tomales Bay oysters and Dungeness crabs are more than worth it. Kitschy decor lines the walls of the low-key restaurant, from tributes to bygone sporting legends to hand-painted menus. AL’s Place is the brainchild of chef Aaron London, formerly of Napa Valley’s well-regarded Ubuntu (now closed). Located at the southern end of the Mission, the restaurant offers mostly vegetable-and-seafood cuisine that is so inventive even diehard meat lovers leave satisfied. The menu is seasonal, but the brine-pickled French fries with smoked apple sauce are a mainstay, thank goodness. Located in a flatiron-shaped building and featuring exposed brick throughout its multi-storey space, Zuni is a Bay Area landmark. (Chef Judy Rodgers was one of the founders of the fresh-and-simple California cuisine movement.) The roasted chicken for two is one of the city’s must-have dishes. In the heart of old Chinatown, chef Brandon Jew serves up reinvented Chinese classics that have earned him a Michelin star. The dining room looks like the set of a film noir, complete with views of the city. Start with a choose-your-own-fortune cocktail (Happiness, Tranquillity, Wealth and Luck are all on offer), and be sure to try the dumplings with squid-ink-infused wrappers and pork stuffing. Named one of America’s Classics by the James Beard Foundation in 2017, this casual Mission restaurant serves traditional Mexican fare in the heart of the city’s Latino enclave. The place draws lines for its soft-shelled tacos and burritos stuffed with chorizo, beef, chicken or pork. Upgrade to a “super” for cheese, sour cream and avocado. A required stop on Potrero Hill’s food-obsessed 18th street, this 300-square-foot café offers espresso drinks, pastries and simple dishes like the Prosciutto and Cheese Toast. The signature Maplewood drink – a blend of cold brew, milk, maple syrup and smoky maple extract – is a must-try and a concentrate is also available to go in 64-ounce growlers. Founded in 1969 by physicist Frank Oppenheimer, this “learning laboratory” features hundreds of interactive exhibits and activities that inspire visitors to explore art, science and human perception. Visit the Tinkering Studio – an on-site research and development lab – to see the latest projects and ideas from the museum’s collaborators, including artists, designers, engineers and scientists. This old beaux arts ferry terminal houses local makers of cheese, bread and chocolate, and a farmers’ market on Tuesdays, Thursdays and Saturdays. Grab a latte from Blue Bottle Coffee or ice cream from Humphry Slocombe as you browse. Sit-down dining options range from Mijita, Traci Des Jardins’ cheap-and-cheerful Mexican eatery, to the Slanted Door, Charles Phan’s justly celebrated high-end Asian-fusion restaurant. Crack open a Dungeness crab that was pulled off a boat a few metres away, order a bowl of cioppino (Italian seafood soup) or grab some clam chowder in a sourdough bread bowl – Fisherman’s Wharf has plenty of things to eat and do. You can find the locals at the nearby Buena Vista Cafe (2765 Hyde St.) sipping Irish coffees. The drive up the steep switchback road to this hilltop park is an experience in its own right. On fog-free days, San Francisco’s main landmarks are visible from the top: the Golden Gate Bridge; domed City Hall; the city’s former tallest building, the Transamerica Pyramid Center; and its current one, the new Salesforce Tower. After a three-year renovation, the gallery reopened in 2016 with almost three times more space to showcase contemporary art. Check out portraits by Henri Matisse and Frida Kahlo, Alexander Calder’s mobiles and local hero Richard Diebenkorn’s streetscapes. Recharge with lunch or a cup of coffee at Cafe 5. Visit the Temescal Alleys – former horse stables converted into small, funky stores – and shop locally made clothing, jewellery and leather goods. For a post-shopping snack, dig into chilaquiles and other Oaxacan fare on the patio at Doña Tomás. Browse the GLBT Historical Society’s exhibits or attend a talk to learn more about the storied past of San Francisco’s queer community. The Main Gallery features long-term exhibits about the assassination of Harvey Milk and the Bay Area GLBTQQ youth activists from the 1970s to the present, while the Front and Community galleries house temporary exhibits. Founded in 1948 by Edith and Brian Heath in nearby Sausalito, this local brand is known for simple, modernist pieces that never go out of style (chances are fairly good that when you’re dining at a San Francisco restaurant, you’re eating off Heath plates and bowls). The showroom in the Mission features a comprehensive selection of kitchenware and ceramic tiles, with windows onto the factory where they’re made. Azalea retails men’s and women’s clothing, shoes and accessories, much of which is made in California. Shop for a trendy souvenir from brands like Welcome Stranger, Stance socks and the store’s eponymous line of women’s basics. Make the shop one of the stops on a leisurely walk from City Hall up hilly Hayes Street to Alamo Square, the park lined by the much-photographed collection of Victorian homes known as Postcard Row. Parked in the Tenderloin, this mid-century motor inn has grit and style to spare, drawing rock ’n’ rollers like The Killers and, back in the day, David Bowie. Dig into a post-party-night brunch at Chambers eat + drink, the hotel’s funky restaurant lounge that features a library stocked with records and overlooks the kidney-shaped pool. After a $21-million reno in 2014, this Nob Hill hotel’s well-appointed rooms feature flat-screen TVs, pillow-top mattresses and Le Labo toiletries. Don’t leave without a visit to Tonga Room, a tiki bar built around the hotel’s former pool, complete with grass huts, potent tropical cocktails and a “lagoon” where the Island Groove Band serenades guests from a thatch-roofed barge. A $30-million facelift gave this affordable Japantown boutique hotel new life. Post-reno, its spacious 225 rooms feature playful nods to the Asian country, like wallpaper with caricatures of famous sumo wrestlers in the guestroom closets. Ask for a south-facing room and watch the fog billow in from the ocean over Golden Gate Park. Built in 1875, the first Palace Hotel was destroyed in the 1906 earthquake; its successor, completed in 1909, remains one of the city’s grandest hotels. An extensive reno in 2015 has refreshed the rooms, fitness centre and glass-covered pool. Occupying most of a block in downtown San Francisco, the hotel’s vast Garden Court restaurant serves up light classic fare. Set amid fragrant Eucalyptus trees, this former military base turned luxury hotel houses a mix of brand new buildings and renovated originals, most of which come with views of the bay and San Francisco’s skyline. Murray Circle offers all-day dining options, from a smoked salmon omelette for breakfast to pork tenderloin served with bacon, labneh and carrot jus for dinner. For a nightcap, head to the Farley, the hotel bar whose namesake is an old comic strip character drawn by local Phil Frank. Since 1928, the Sir Francis Drake has occupied one side of Union Square, known today as the centre of the city’s main upscale shopping district. The updated guestrooms are outfitted with plush furnishings, and doormen in Beefeater uniforms welcome guests into the ornate lobby. Order a negroni or pisco sour at Bar Drake, the busy ground-floor watering hole, and don’t miss the Sunday brunch drag show in Starlight Room on the 21st floor. The inn’s main building is an old military officers’ quarters that underwent an expensive conversion in 2012, transforming the 1903 Georgian Revival building into a luxury lodge with 22 spacious guestrooms. The property is well-suited for a family vacation – explore the beaches and forest of the surrounding Presidio, a vast national park and former army post, or head to the nearby Walt Disney Family Museum. The inn’s four-bedroom Victorian cottage, the Funston House, can accommodate large groups or families. The Bay Area Rapid Transit system (BART) links travellers from San Francisco International Airport (SFO) to downtown San Francisco. (Rates vary depending on the length of the ride.) A taxi will get you downtown for around $45 to $60, and takes about 30 minutes depending on traffic. The one-way fare on the city’s buses and streetcars is $2.75, and a single ride on its iconic cable cars costs $7.00. Visitors planning to circulate around the city on any of these can buy a pass for one day ($21), three days ($32) or seven days ($42). Tickets to the BART can be purchased in the stations, and rates depend on how far you’re going. Taxis are easy enough to hail on some major arteries – Market Street and Van Ness Avenue– and in the financial district. But elsewhere, it’s best to call in advance or to use the Flywheel app, which sends ride requests to several major cab companies. Lyft and Uber are also available. Cycle San Francisco’s hilly terrain on a Ford GoBike from one of the 540 automated stations around the Bay Area. Fares cost $3 for a single trip, or $9.95 for the day. 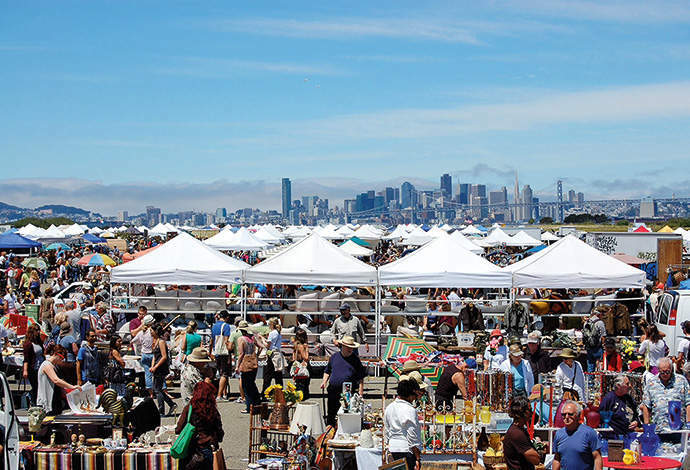 From local gin to collectible toys, here's how to save and splurge on the island of Alameda. Just like the island of Alameda, which is nestled between San Francisco and Oakland, this intimate, tree-house-style restaurant keeps a low profile. To make a dinner reservation, you must show up in person on the day (go before noon), but an omakase meal here is worth the extra effort: The nigiri features some of the most impeccably sliced fish in the Bay Area. With its wrought-iron chandelier and heavy wooden furniture, this Lithuanian eatery resembles a medieval tavern. Once the charismatic owner (whose mama runs the kitchen) has greeted you, start with the cepelinai – a potato dumpling that’s one of Lithuania’s favourite dishes. Finish with a slice of medutis, a delicate, seven-layer honey cake. On the first Sunday of every month (weather permitting), 800 vendors gather for the area’s largest antiques show. The former naval base bustles with treasure seekers of all stripes, from families to keen-eyed retirees. There are plenty of suitcase-friendly items to be found, like old baseball cards, vintage cookware and first-edition books. Few shops better capture Alameda’s small-town spirit than this family-run business, which is crammed with board games, model kits and collectibles. In keeping with the island’s old-timey sensibility, Toy Safari’s real treasure is its vintage section, featuring a large collection of Star Wars figures and shelves’ worth of hard-to-find Lego sets. On a tour of this craft distillery, located in a 65,000-square-foot airplane hangar, you’ll get a taste of the spirit-making process, from the fermentation tank to the bottling line. Afterward, sample six of their vodkas, gins and liqueurs, which capture the flavours of Northern California, like the Terroir Gin, with notes of Douglas fir. With a patio that offers views of the San Francisco skyline, five-ounce tasters for just $2.50 and rotating food trucks on site, it’s easy to while away an afternoon at this kid- and dog-friendly brewery. Start things off with their flagship brew: the Faction Pale Ale, which is smooth with a pine kick that makes it extra fresh.